The DisplayRite System Telescopes in both height and width. The height telescopes quickly and easily from 36" to 96" high including any stop on the way. Depending on the model, the width telescopes as quickly and easily from 30" to 96" wide with any stop in between. 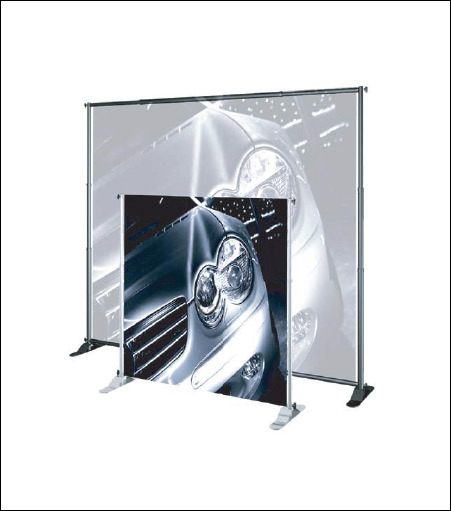 This versatile display system adapts as your needs change. Choose one of the 2 regular & 2 Heavy Duty sizes to meet you needs. Simple to use - Hem banner with either a 2 1/2" or 3 1/2" sleeve, depending on the model. Assemble in minutes with crossbars going through the sleeves. For other graphics without hems, use metal clamps. Extends to up to 12 ft! Well-constructed black travel bags with shoulder strap and assisted handle. Carry messages and presentations from one location to another. The ability to quickly set-up, pack up and travel can be crucial.